On Monday 22nd April 2019 the sun will rise at 07:52 and will set at 18:42. It will be a mild day, with temperatures reaching around 15.5°C. Today is expected to be a dry day, with a very low chance of rain. It will be a very clam day today, with a maximum expected wind speed of 11mph. On Tuesday 23rd April 2019 the sun will rise at 07:52 and will set at 18:42. It will be a mild day, with temperatures reaching around 19.9°C. Today is expected to be a dry day, with a very low chance of rain. It will be a very clam day today, with a maximum expected wind speed of 10mph. On Wednesday 24th April 2019 the sun will rise at 07:53 and will set at 18:41. It will be a mild day, with temperatures reaching around 21.4°C. Today is expected to be a dry day, with a very low chance of rain. It will be a very clam day today, with a maximum expected wind speed of 6mph. On Thursday 25th April 2019 the sun will rise at 07:54 and will set at 18:40. It will be a mild day, with temperatures reaching around 18.6°C. Today is expected to be a dry day, with a very low chance of rain. There will be a gentle breeze in the air today, with a maximum expected wind speed of 13mph. On Friday 26th April 2019 the sun will rise at 07:55 and will set at 18:39. It will be a mild day, with temperatures reaching around 14.2°C. Today is expected to be a dry day, with a very low chance of rain. It will be quite a breezy day, with a maximum expected wind speed of 26mph. On Saturday 27th April 2019 the sun will rise at 07:56 and will set at 18:37. It will be a mild day, with temperatures reaching around 12.5°C. Today is expected to be a dry day, with a very low chance of rain. There will be a gentle breeze in the air today, with a maximum expected wind speed of 15mph. On Sunday 28th April 2019 the sun will rise at 07:57 and will set at 18:36. It will be a mild day, with temperatures reaching around 15.3°C. Today is expected to be a dry day, with a very low chance of rain. There will be a gentle breeze in the air today, with a maximum expected wind speed of 11mph. On Monday 29th April 2019 the sun will rise at 07:58 and will set at 18:35. It will be a mild day, with temperatures reaching around 11.8°C. Today is expected to be a dry day, with a very low chance of rain. It will be a very clam day today, with a maximum expected wind speed of 8mph. Wanting to discover the Mornington Peninsula? One of Australia's finest grape growing regions. Famous for Pinot Noir and cool climate Shiraz. 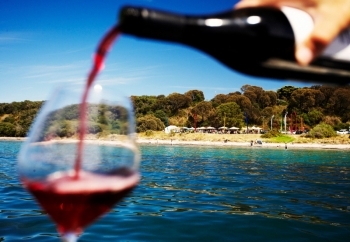 We have created Limousine private group packages to the illustrious Mornington Peninsula wineries. We pick you up from your location and return you after a great day out. All inclusive tours with gourmet lunch & visiting 4-5 Mornington Peninsula venues. We require a minimum private group of 6 passengers. Groups are not mixed so take your friends family for a fantastic day out.